Tick bites are usually harmless but there are several ticks that can transmit disease to humans. Lyme Disease is spread by the deer tick with typical cutaneous symptoms of an expanding circular or ring-shaped skin rash. Later, systemic symptoms may occur such as fever, headaches, muscle and joint aches, and heart abnormalities. Rocky Mountain Spotted Fever is a life threatening illness that is transmitted by the dog tick. Despite its name, it is very commonly spread by ticks in the mountains of North Carolina. Symptoms include fever, headache, muscle aches, and a skin rash that spreads from the ankles and wrists to the rest of the body. Brown recluse spider bites cause a painful bite that later may develop into a bruise or blister. 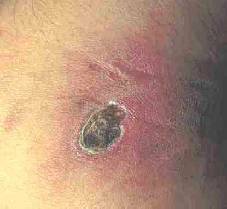 The bite can become crusty and ulcerate into a non-healing wound. Black widow spider bites typically are not painful but within several hours patients develop a systemic reaction presenting as muscle pain, stomach pain, and breathing difficulties. Bed bugs bite at night and cause red, itchy, crusty bumps on the skin. Bee Stings cause a sharp pain. A red, swollen, tender bump occurs at the site of the sting. In rare cases, some patients can develop a systemic, life threatening reaction called anaphylaxis. Mites such as scabies and chiggers typically cause intense itching and red bumps in the areas of infestation. Fire Ant Bites-cause a sharp stinging pain and burning sensation. A small blister or pus filled bump usually occurs a few days later. In rare cases, some patients can develop anaphylaxis to fire ant bites. Lice bites usually present as small, red bumps on the shoulders, neck, and scalp. They are very itchy and are a sign that there are probably numerous nits and lice in the scalp.